A wine tasting fundraiser can put the fun back in fundraising, but this type of event requires special planning considerations. Begin brainstorming for your event at least four months in advance. You need time to coordinate volunteers, acquire enough wine, advertise the event, and do dozens of other tasks that will lead to a successful fundraiser. When you take the time to plan the big event, your fundraiser is sure to be a rewarding and enjoyable experience for all involved. Once you have decided to go with a wine tasting to help raise money, you need to determine exactly what your financial goal is. Be ambitious but realistic when it comes to assessing how much money you need for the organization and how much can be raised at the wine tasting. Also determine how you will handle any funds that exceed your goals. Based on how much you money you need to raise, next set a budget for the event. Unless people are willing to donate these things for the organization's use at the event, keep in mind that you'll need to pay for the space where you hold the wine tasting as well as all the wine, refreshments, and entertainment. Choose a date for your event that will attract the most visitors. Ideally hold it on a Friday evening or the weekend to attract as many people as possible. Once you do, make sure to reserve the location for your event and make any down payment that's necessary to finalize your plans. Plan for a few hours of set-up and clean-up for before and after the event, so it's best to err on the side of caution when renting a location. Give yourself plenty of time so it won't be a stressful event. Some fun places where you may want to hold your wine tasting include local museums, theaters, and restaurants that may have unusual themes. Italian restaurants are often safe bets. Ballrooms in hotels are great for larger events. Also, if you have local wineries, you may see if they would want to be involved. Don't forget that every state has its own regulations and even laws about how alcohol should and should not be used as part of events and fundraisers. Be sure to call your local Alcohol Beverage Control Board prior to finalizing any plans for your event to make sure that your plans adhere to local laws. To make your wine tasting fundraiser a smashing success, you need to have a great team of people who are dedicated to helping your organization. Hold several meetings for volunteers starting at least a couple of months before the event. This allows you to see how reliable each volunteer is and it gives you the opportunity to give necessary information to your volunteers. The more you all get to know each other as a team, the easier it will be to work the event together. Contact a wide variety of winemakers to ask for wine donations. Be sure to be forthcoming with details of your organization and how making the donation will benefit the business. Contact companies that produce affordable wines as well as those that produce more expensive and exclusive wines. You are likely to be able to get enough donated wine to cover your event needs. If not, you may need to draw from your budget to get more bottles of wine. Another way to make the wine purchases appealing and unique is to create art on the wine bottles. Be sure that you have each wine clearly labelled on the bottom of the bottle before attempting to hide the label with artistic creations. If the fundraiser is for children, you may even consider pasting the art of the kids who will benefit from the fundraising on the bottles. If you are raising money for animal rescue, wine bottles with art depicting happy, joyful animals may be a hit. When possible, coordinate the themes on the artistic bottles with the night. One way to earn more funds and attract more patrons is to hold an auction as part of the wine tasting fundraiser. People will be mingling and relaxed, and they can offer bids on items that are on display in the area where you serve the wine. While it is fun to include wine-related items as part of the auction, you can include a variety of donations. Make the center of the auction a wine pull. This is when you mix expensive bottles of wine with cheaper bottles of wine. Wrap them all up, then allow people to buy into the wine pull for a chance to choose a bottle that may be of the more valuable variety. This is sure to be a crowd-pleaser. It's important to focus on the big picture, but also be sure to consider the essential things that make up the ambiance of your fundraiser. You need to have some forms of entertainment at your event in addition to the wine tasting. This can be something as simple as a temporary stereo that plays classical music, or you may spring for a live band to really add a special feel to the event. Think of those who are coming to your event and what they will most enjoy when you plan the night's entertainment. It goes without saying that wine tastings are only for people who are at least 21 years of age or older. However, sometimes families may have a hard time finding babysitters or simply want to take everyone out together. That just won't work well for the adults-only event that a wine tasting should be. 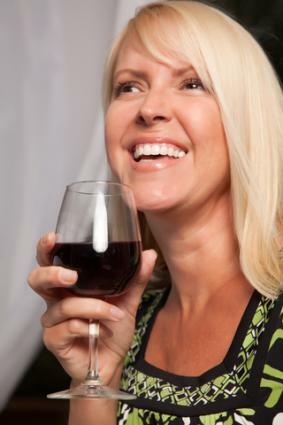 So set strict age limits and make sure they are listed in bold print on all advertisements for the wine tasting. Have a couple of hosts positioned at the door or entryway to your wine tasting fundraiser on the day or night of the event. Hosts should check ID if in doubt, and they should be instructed to politely turn away anyone who is not old enough to be at the event. As an extra precaution, you may also want to have the workers who are serving the wine check the age of patrons. Alternately, have hosts give out wristbands that cannot be easily removed to identify those who are old enough to drink and enjoy all that the wine tasting has to offer. Ask for volunteers to be designated drivers on the night of the event. This works best when volunteers can show up and work the event, then be on hand in case they are needed to drive people home. Although wine tasting may seem like a sophisticated gathering where people just take small sips of different wines, the truth is that many people come to this kind of event planning to drink quite a bit. Patrons may purchase wine and want to be served full glasses on the spot. So be prepared for worst case scenarios. Make sure that all servers are informed about the signs of intoxication. If people go to leave who you suspect may be drunk, politely offers to have a designated driver take them home free of charge. If they want to pay, you can accept additional donations towards the cause. The only surefire way to get a lot of patrons to attend your wine tasting event is to get the word out. Advertise in local papers. Make flyers to hand out around town and ask shop owners if you can leave some at the check-out counters. Email all your current supporters to let them know about the wine tasting fundraiser. Also, look into target online advertising. Online advertising is one of the most effective and popular ways of reaching people now. You may also send out invitations to your high donors. Be sure to include details about your dress code for the evening on all advertisements and invitations. Be sure to stay at the wine tasting fundraiser from beginning to end. Welcome guests as they come in and let me know about all that you are offering throughout the evening. When you set the tone for a great time with excitement in your voice and words, you will elevate the expectations and sense of fun that your guests experience. Also, stand back and supervise the goings-on from time to time. Mingle with all the guests throughout the evening and be sure to address any issues as they arise. When it comes to hosting a wine tasting fundraiser, it's important to expect the unexpected. Life may throw curve balls your way, but planning early for the event should prevent most potential problems. When it's all over, be sure to send thank you notes to all your patrons who came to the wine tasting or otherwise supported the event.